Based on success in Colombia, partnership is expanded to accelerate growth of on-site generation technology in 17 Latin American countries. Their strong relationships and understanding of the market, excellent customer service and resident technical expertise align well with the goals and values at MIOX. MIOX Corporation, a leader in safe water disinfection, announced today the renewal and expansion of its partnership with Colombian-based USA Global Market S.A. to include exclusive distribution of MIOX on-site water disinfection products in the municipal water and wastewater markets in 17 Latin American countries. 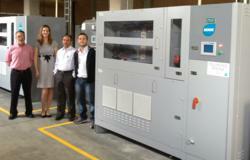 USA Global Market has distributed MIOX products in Colombia since 2009 with growing success. Key installations include a water treatment plant near Medellin, Colombia, that provides water for 800,000 residents and a MIOX installation with the Acueducto de Bogotá in the El Dorado plant, which services the city of Bogotá. The Acueducto recently purchased two large-scale RIO Grande™ units for Planta Wiesner, the largest water treatment plant in Colombia. USA Global Market is a significant partner for MIOX, not only in large municipal projects but also in small communities, working with MIOX on numerous rural installations that improve access to safe water for underserved populations. Given its technical expertise, experience and regional partnership network, USA Global Market is poised to significantly expand sales of MIOX products in the public water and wastewater treatment sector in Latin America. Generating sodium hypochlorite or advanced mixed oxidant solution on site eliminates the need to purchase, transport and store hazardous bulk chemicals. MIOX mixed oxidant solution offers all the disinfection power of hypochlorite with additional treatment benefits including reduced or eliminated biofouling, disinfection by-product (DBP) reduction, improved taste and odor, and improved water clarification processes. MIOX Corporation (http://www.miox.com) is focused on solving one of the world's most pressing issues: the need for affordable, safe, and healthy water. MIOX's patented water disinfection technology replaces the need to purchase, transport and store dangerous chemicals. MIOX is used in over 30 countries and in hundreds of communities across the U.S. for public drinking water systems, water reuse projects, and a variety of commercial and industrial applications. USA Global Market S.A. specializes in producing and distributing technologies related to public services - water, energy and gas supplies. The production and distribution of anti-skimming and anti-fraud devices for gas and water systems has been the main focus of the business for the last five years. Today, USA Global Market supplies products and services to more than 150 aqueducts and is introducing new green technologies for water systems throughout Latin America.